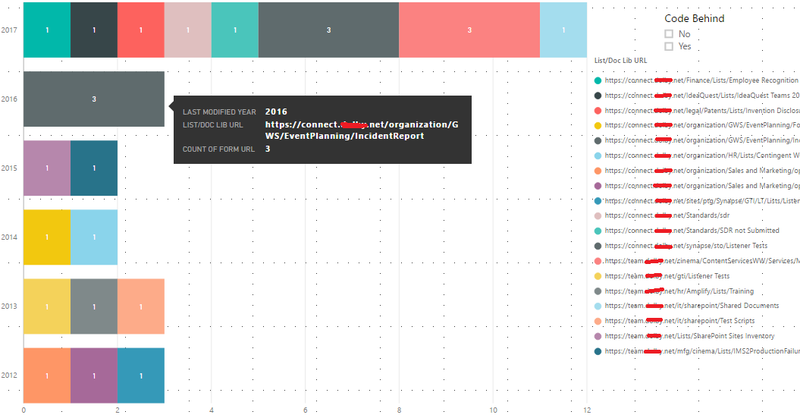 Netwoven Blog How to use Power BI in the context of SharePoint? 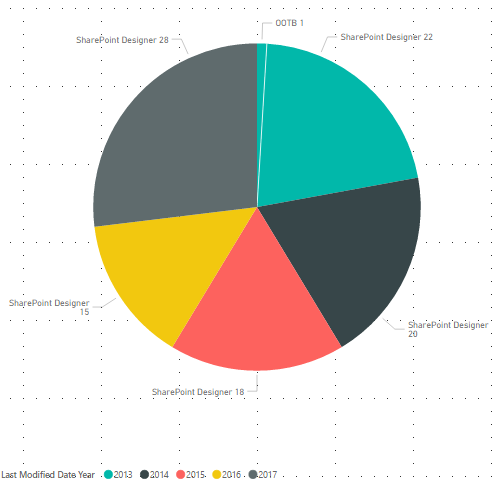 How to use Power BI in the context of SharePoint? Anyone who knows the pain of presenting data in the form of charts/graphs, with added complexity of dynamic filters. However, if you are a consultant, trust your skills to link even oranges to iPhones…if you ask me how, I’d say iPhones are from Apple, apples and oranges are fruits…any further explanation required :D ? At the minimum all you need to know is that each set of raw data/spreadsheet in PowerBI is known as a Field and its representation is termed Visualization. 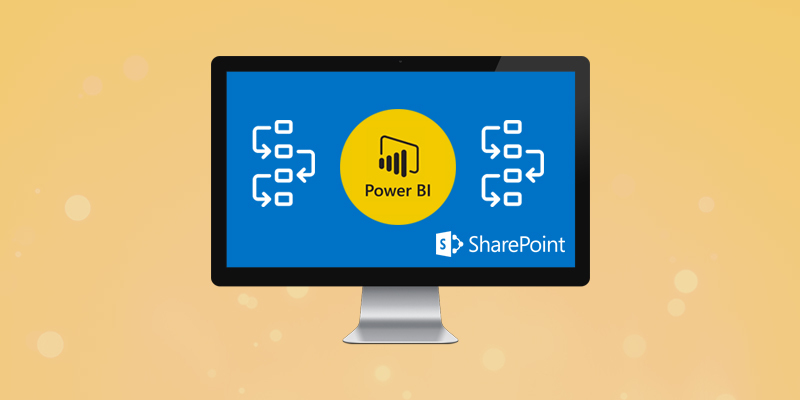 What is the link between SharePoint and PowerBI? The first use of PowerBI that you can see in your SharePoint platform is for a health check or maintenance of your SharePoint environment though not much without the help of the SharePoint admin who would run a few reports on the SharePoint farm. Isn’t this blog relevant to the IT team? Yeah, IT is always the first team to be blamed if anything goes wrong 😊. Well, while the IT team is diligently working towards implementing SharePoint governance and maintaining organizational security, I bet you’d enjoy maintaining your own set of site(s)/site collection(s) once you have the PowerBI reins, though still with the organizational SharePoint admin support. 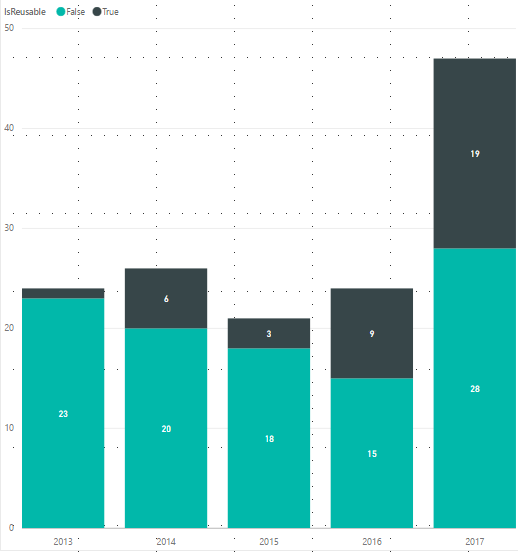 How is PowerBI visualization different from other tools? I’ve used very basic charts and analysis in this article to give a glimpse of how this application can be used, though my data analysis is on the entire SharePoint farm with 3 web applications, to show the complexity of data that can be handled, at the same time making it appealing to readers. The explanation of the data set is continued in the following sections. The freshness of content plays a vital role in picking sites/subsites to migrate. 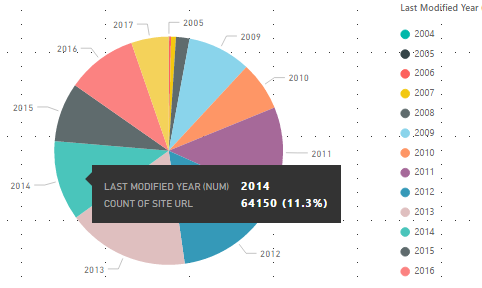 Hence, a Pie Chart is a preferred representation of content freshness information owing to display of count of sites/subsites along with the percentage. Content size is another deciding factor to estimate duration and effort of migration. 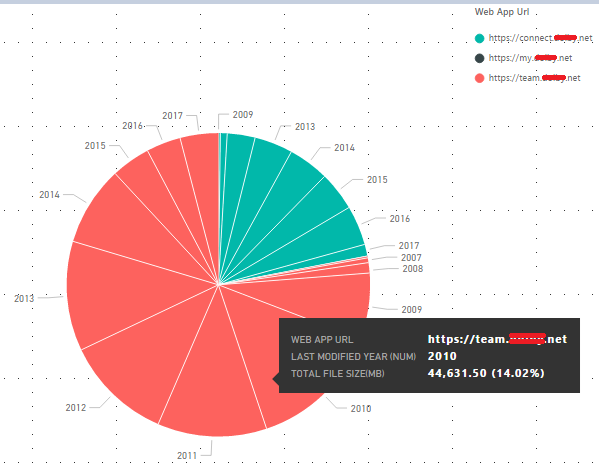 Hence, similar to Site Freshness – Count by Year, a Pie Chart suits the representation of split of content size over multiple web apps by year. InfoPath forms require a post migration fix, that may also be dependent on code behind the form. As multiple InfoPath forms can exist in a list or a document library, grouping the count of InfoPath forms by list/document library URLs in a Stacked Bar Chart representation helps to view distribution of InfoPath Forms by last access of list/document library. An additional Slicer for Code Behind (Yes/No) filters out lists/library URLs where such forms are used. Reiterating that FastTrack migration might not support an IA redesign, there may be events where Globally Reusable and Reusable workflows may require to be recreated multiple times depending on the SP web containing the list/library associated with them. Similar can be the case with workflows associated with content types if the content types are used on SP Webs that don’t maintain the same hierarchy or are moved to other site collection targets upon migration. While the actual number of recreations is still a figure that’s awaiting the approved IA redesign, a Stacked Column Chart can be created to check the distribution pattern of workflows on lists over years. As in my case with the provided examples, I’ve created some content inventory in the form of spreadsheets for my SharePoint application on the farm that serves as input to the PowerBI application. The following tabulation details all report data with respect to reference by name in Power BI. PowerBI is smart enough to link different data sets based on uniqueness of columns. The link between different datasets is termed as Field Relationship, which is nothing but a connector between two fields. However, if you don’t desire the default relationships, you could also set up your own. Since this guide is simplistic in nature, the following table helps to establish some basic relationships between various data sets that can be used to enhance level of filtration to check impact and complexity. With the myriad of visualization patterns and filters that Power BI offers to analyze data, it would be unfair to advocate only from the aforementioned patterns for analysis. However, this analysis aims to provide a fair estimate of count and pattern that can further be exploited. Until my next article where I’ll demonstrate how to get started with the application, PowerBye-Bye!